Finally, some photos from our March meeting! 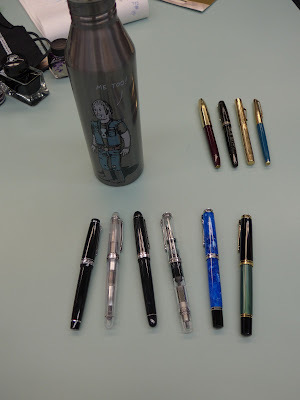 Speaking of Jerred, here are the fountain pens he brought in for our topic----all nicely reground by himself. They're the top group in the photo below (from L-R): Jinhao X750 with Medium Architect Grind (the door prize! 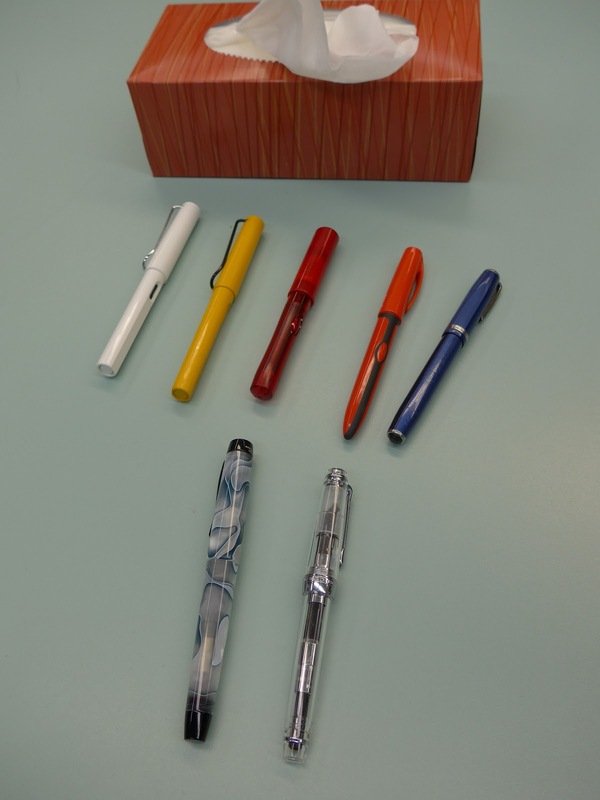 ), Noodler's 'The Charlie' with Waverly modified nib, Visol Caseti Rorschach with Cursive Italic nib, Faber-Castell 'Ambition', Pilot 'Metropolitan' with Postal modified nib, $2 special from Daiso with Right-Hand Oblique Round nib, Ohto 'Proud' with Right-hand Oblique Italic nib, Schmidt 'Intrinsic' with Left-Hand Oblique Round nib, Jinhao X450 with Cursive Italic nib, Zebra FP, Sheaffer Prelude with Double Broad Architect Grind, and a Jinhao 599A with an XF (Extra-Fine) Architect Grind nib (I wrote about it in this blog post). 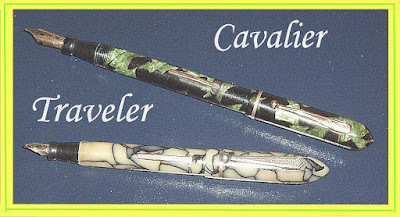 Below Jerred's fountain pens, we have two lovely fountain pens with reground nibs brought in by Bruce--a black Pelikan M805 with an 18K Broad nib that was stubbed by Richard Binder, and a gorgeous Visconti 'Voyager' 25th Anniversary fountain pen with a 23K Palladium 1.3mm stub nib which was narrowed and crisped by John Mottishaw. 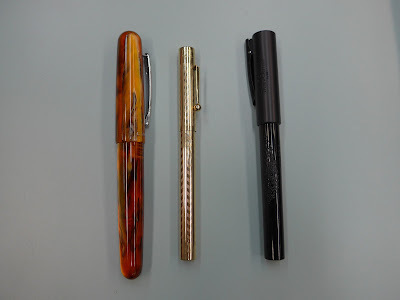 From L-R: Alejandro's elegant white Lamy 'Safari', Tim's own Safari in yellow, along with his red Pelikan 'Pelikano Jr', red Pelikan 'Grand Prix' (not a model you see very often---ie. I don't own one...yet lol) and blue vintage Esterbrook. Below that are a couple of pens brought in by Ricardo---a Monteverde 'Intima' in Glacier Blue (nib worked on by Jerred) and a new acquisition-a very nice Sailor ProGear Slim demonstrator. 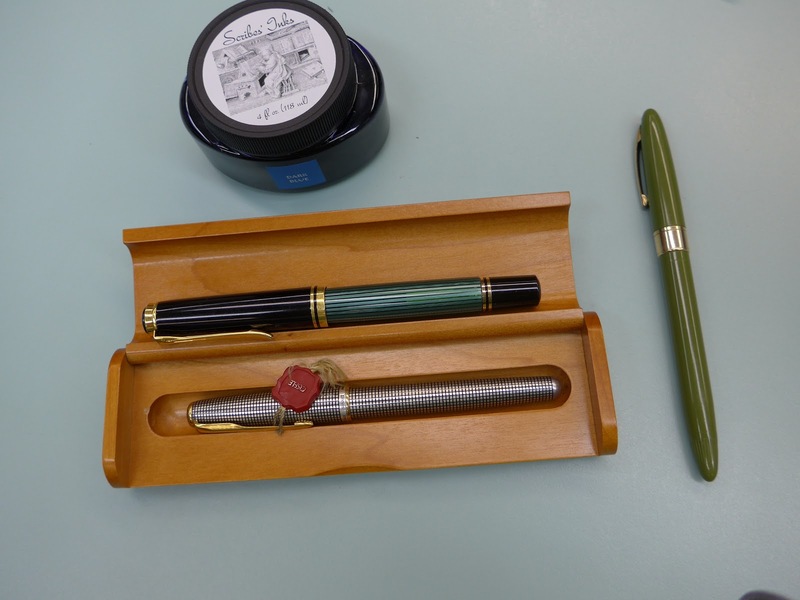 Two wonderful new acquisitions belonging to Bill K---a green-striped Pelikan M800 and a Parker Sonnet in the crosshatched 'Cisele' pattern. New member John brought in a Sheaffer 'Snorkel' in the rare Fern Green colour. David R. brought in six great fountain pens with expertly reground nibs. 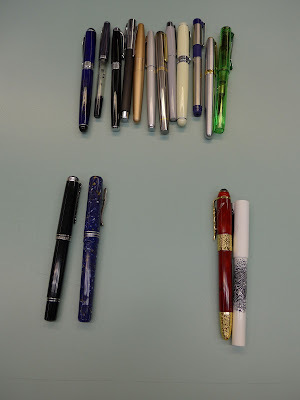 They're the group at the very bottom of the photo below --(left to right) Sailor Pro Gear Classic, Platinum Nice Pur, Platinum 3776 Century, Pelikan M805 Demonstrator, Pelikan M805 Vibrant Blue and Pelikan M800. The Pro Gear Classic has a medium cursive italic ground by John Mottishaw and the Pelikan Vibrant Blue has a medium stub ground by Dan Smith. Stuart brought in some pens whose nibs were repaired, adjusted and/or reground by our own Mark Harcourt (I wrote about his pen repair business in this blog post ). 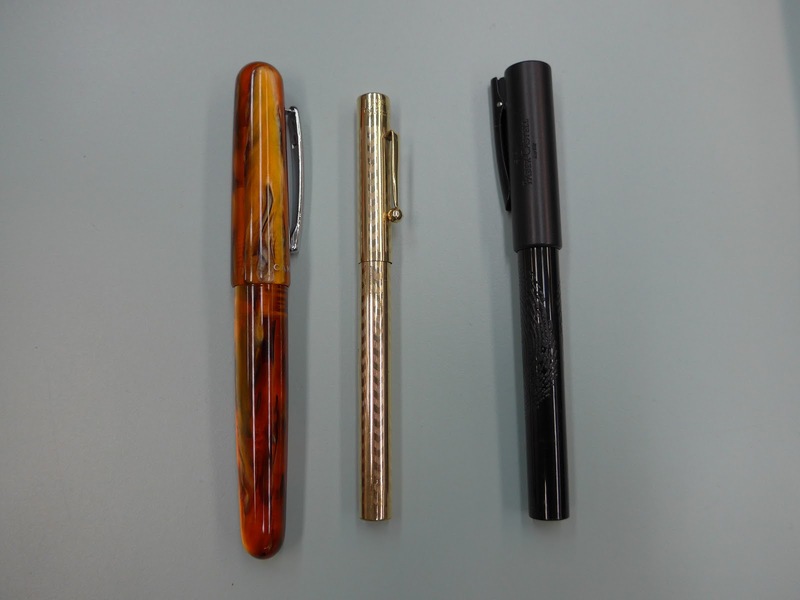 They're the top group in photo below: (L-R) a Sheaffer PFM (Pen For Men) V model, a Parker 'Vacumatic', a vintage Wahl-Eversharp 'All-Metal' pen, and a Waterman C/F. 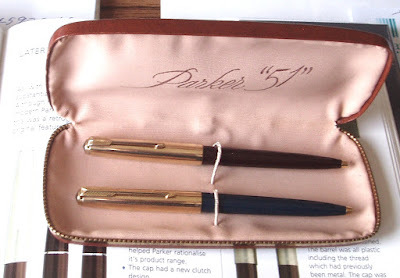 David R's fountain pens and two nifty pen cases by Nock ---the orange 'Lookout' model and a brown 'Sinclair' case. 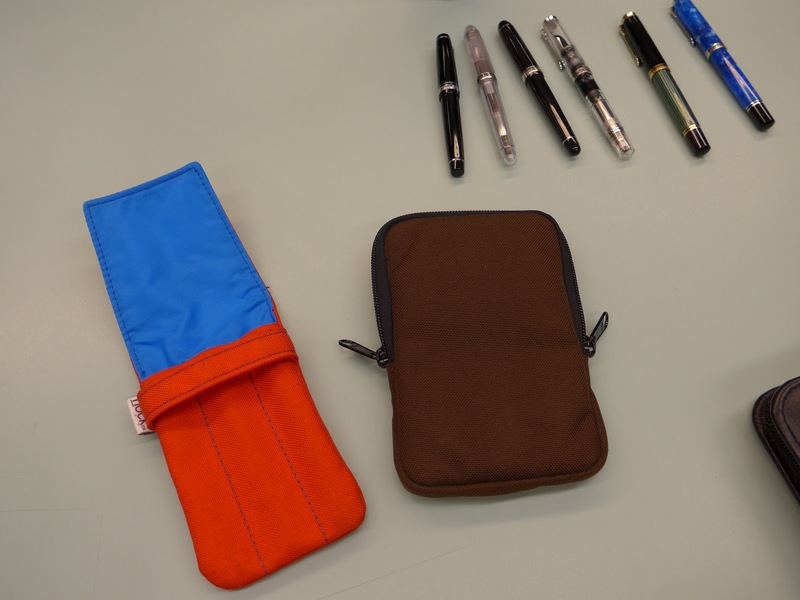 Nock is an American company that makes handmade pen cases in the U.S.A. 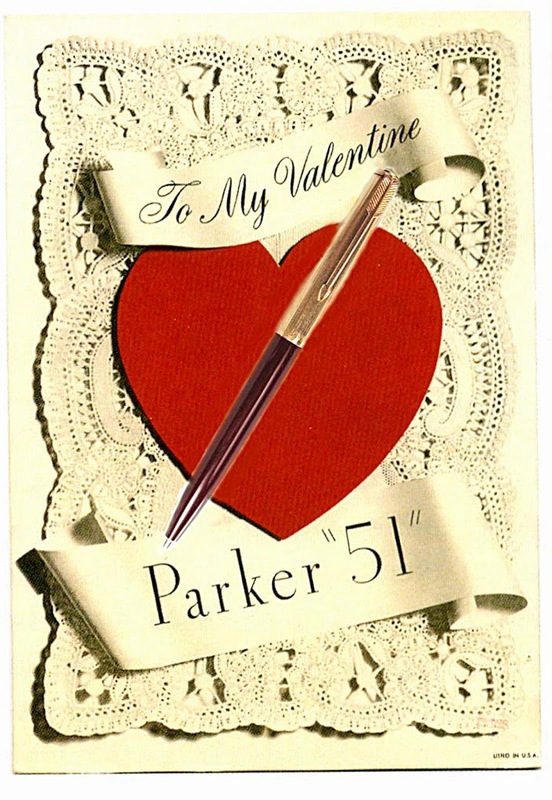 They raised funds for their first product back in 2013 with a Kickstarter campaign, and have since expanded their line of pen-related accessories. The cases are well-made and I've only heard good things about them, so they're on my wish list! Below are some new acquisitions that Stuart brought to February's meeting. 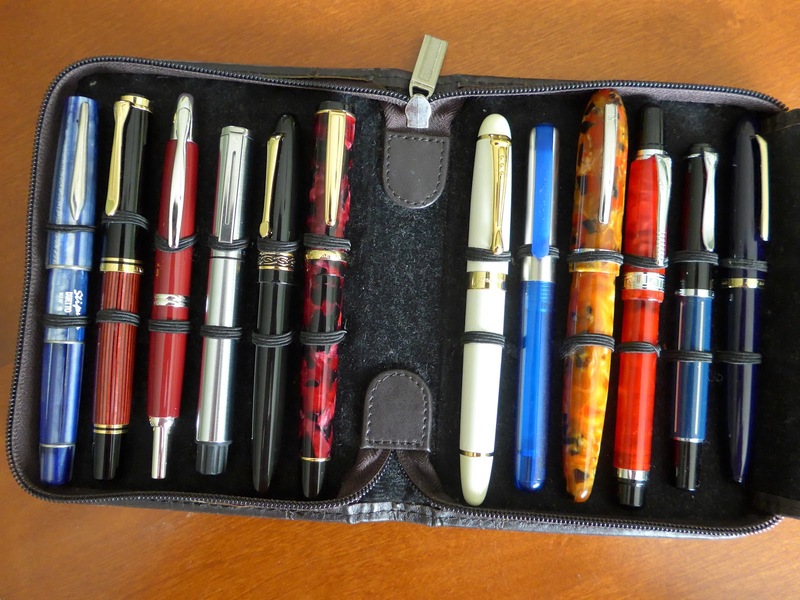 It was a busy meeting and I missed the chance to photograph the pens, so I asked Stuart to bring them to the March meeting (which he did). From L-R: Campo Marzio 'Ambassador', an Ingersoll all-metal lever-filling pen, and a Faber-Castell 'WritINK'. 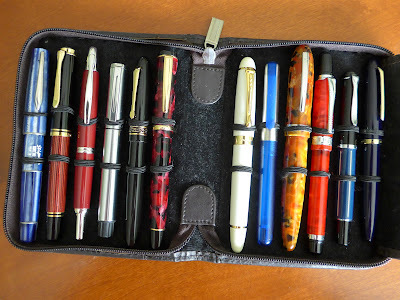 I also left without photographing some of Angela's fountain pens that she brought to a previous meeting, but she was nice enough to snap a quick photo of them for our club's blog after I asked her (thanks, Angela!). From L-R: Sheaffer 'Fashion', Parker '51', a couple of Jinhaos, Pilot 'Prera', a vintage Esterbrook and a stylish Montblanc Greta Garbo Limited Edition. A quick snap of my own reground-nibbed fountain pens in the photo below. 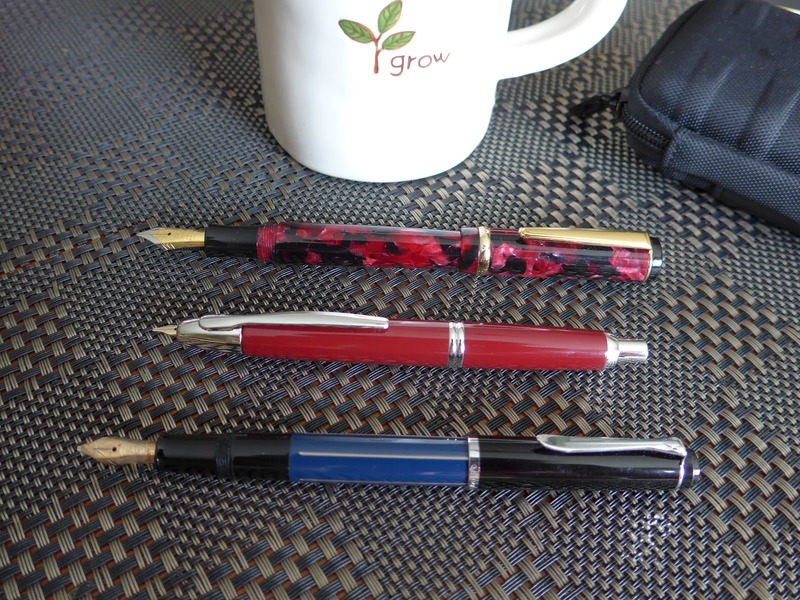 From L-R: a "Binderized" (nib tuned Richard Binder of RichardsPens.com) Stipula 'Duetto', a Mottishaw'd (nib reground by John Mottishaw of Nibs.com ) Pelikan M800 with cursive italic nib, a Pilot Vanishing Point (my first pen show purchase) and a Sheaffer 'Award', both with cursive italic nibs ground by former longtime Sheaffer employee Letta of Pendemonium.com, an Italix 'Parson's Essential' with a stub nib from Mr.Pen (I wrote about it here), a Rosetta 'Magellan' with a nice italic nib (not sure who worked on it, though--I bought it from fellow VPCer Bob M.), and then a couple of pens worked on by two young nibmeisters (an ivory Jinhao X450 with a super 0.7mm stub done by Tyler Dahl and a blue Pelikan 'Pelikano' with a nice crisp italic done by Dillon Ang), followed by two pens with great stubs done by Vivek N of Pentrace---a Laban 'Mento' and a red Genius 'Bucky'. The second-to-last pen on the right is one of my all-time favourite writing instruments; it's a Pelikan M215 with a juicy broad stub, done by a mystery nibmeister. The very last pen on the right is a Sailor Calligraphy pen I reground myself from a Fude nib to a stub. 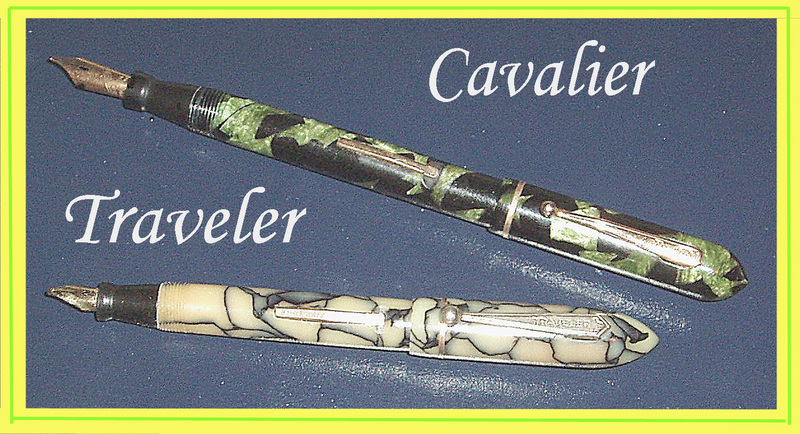 A closer view of three of my pens mentioned above. My apologies for the blurry photo--it's hard to tell from the photo, but all three are wonderful writers! I highly recommend you consider getting a fountain pen with a regular factory nib (e.g. 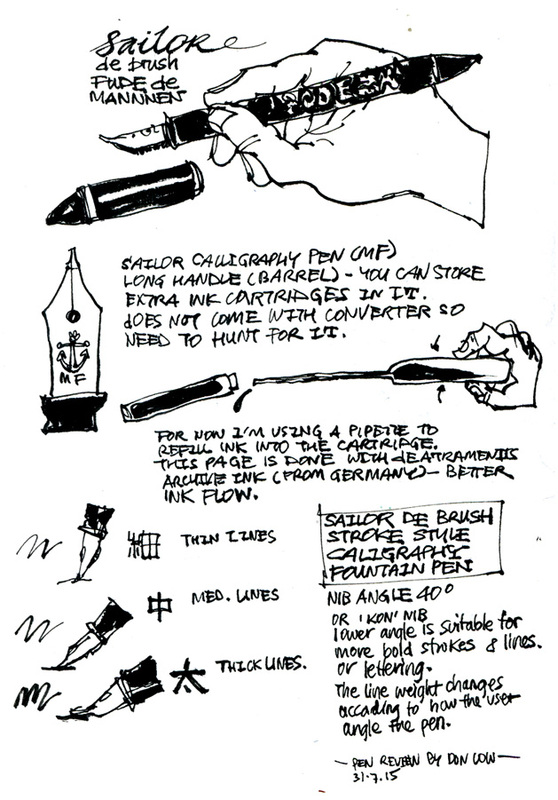 Fine, Medium, Broad, etc) reground by a competent nibmeister if you're bored with how your fountain pen writes; it will almost certainly improve your writing experience... and in the case of stubs or italics, make your handwriting both nicer and easier to read! 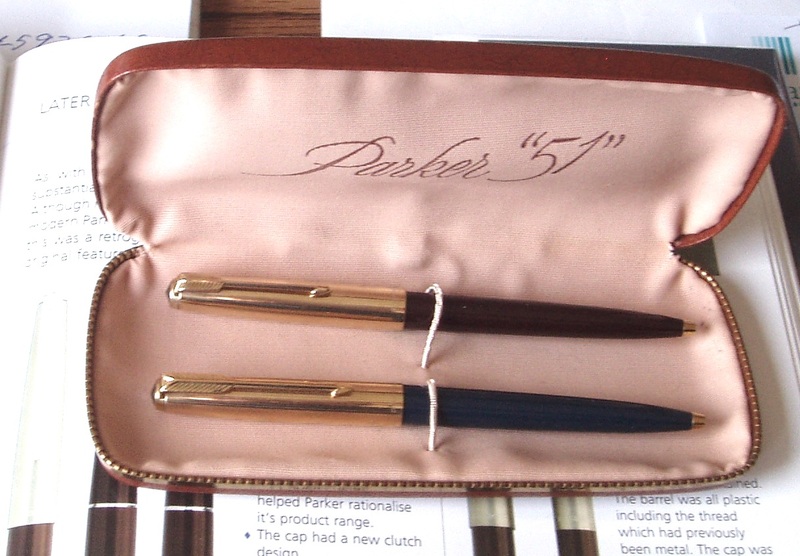 Chris’ classy dark blue with gold cap Parker '61' ballpoint and Christopher's "new" Parker '51' ballpoint, in an original Parker '51' box. Many thanks to Christopher for the photos! 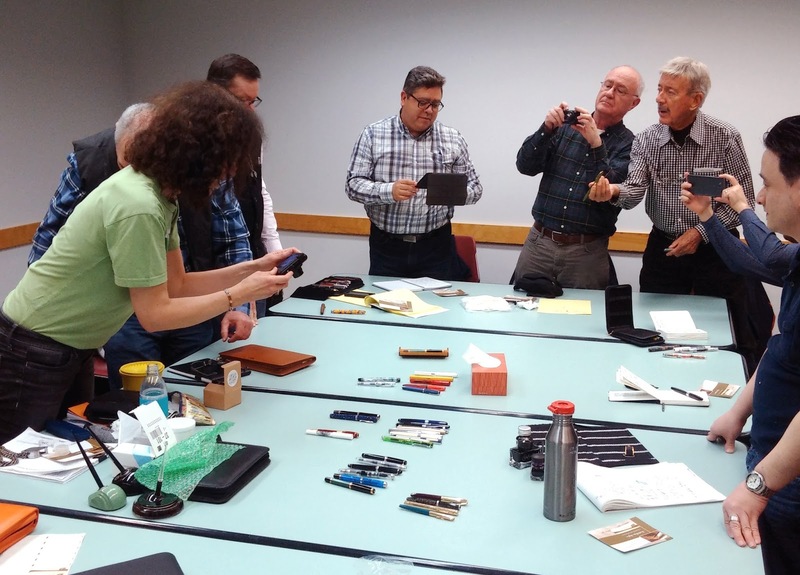 A big "Thank you" to *all* members who came to the March meeting---those who brought in pens to show, and those who came without pens! Our club is all about seeing, talking about, trying out & learning about writing instruments in a fun, casual setting... so even if you don't have any new stuff to show or anything for the monthly topic/theme, please come to the meeting anyway ! Our next meeting is at the Terry Salman branch of the Vancouver Public Library (info here) on Thursday April 20 from 6:00pm to 8:45pm ~~please note the venue change~~and the topic will be "Your Favourite Japanese Fountain Pens". 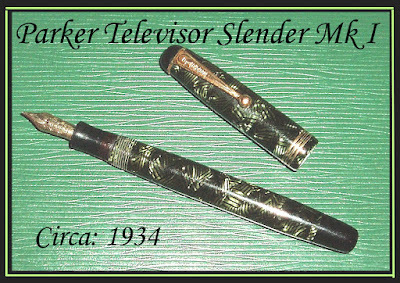 Secondary topic is Newest (pen-related) Acquisitions. Hope you can make it!